Emmy Mom--One Day at a Time: Living Room Reveal! Last week I asked for all of your help with my living room, in this post. I got so much great advice from all of you. I was excited just to jump in and start it. Friday night after the kids were in bed, I left Eric to watch a basketball game and I went shopping. I went to Home Goods- have you ever been to one? I never had and let's just say I am in love! I wandered around the store and I saw these chairs. I stopped, sat in them, sent this picture to Eric and said a good possibility. I kept looking and wandering but kept coming back to the chairs. I ended up paying for them that night (picked up the next day). While I was out, I swung by Ross which was next door and I found this beauty And it all came together for my new living room. As I said I picked up the chairs the next day with Eric's help. We brought them home, just set them in the adjacent room and then I had to go with Alex to her soccer meeting. When I came home my living room was all set up! Eric had carried the green love seat couch upstairs to our bedroom all by himself and set everything up. I was floored! Yes my husband rocks- and I am not even saying that because it is his birthday on Wednesday. The chairs ended up not being as bold or as bright as some of the chairs I was looking at, but I really really like how well they go with the couch and at 50% off retail I could not pass them up. I will probably look for a plant or some tall decorative thing for one of the corners still, but I am loving my new living room. Your living room looks great. I love the chairs! They match so well. I'm not sure if it was just the pic or not, but the one pic of just the chair, the leg looks crooked...like it might be loose. You might want to check on that so it doesn't break off. I love every single thing you did with the room. It looks fabulous! Those chairs are perfect! Your living room looks amazing. Those chairs are great! I live those chairs. Wow. it looks fantastic and sophisticated! love it!!!! 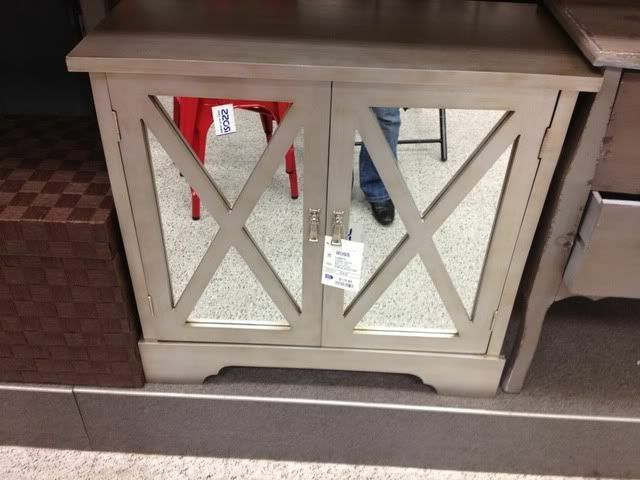 I love Home Goods!!! Great chairs and I love the mirrored hutch. Perfect! So cute! 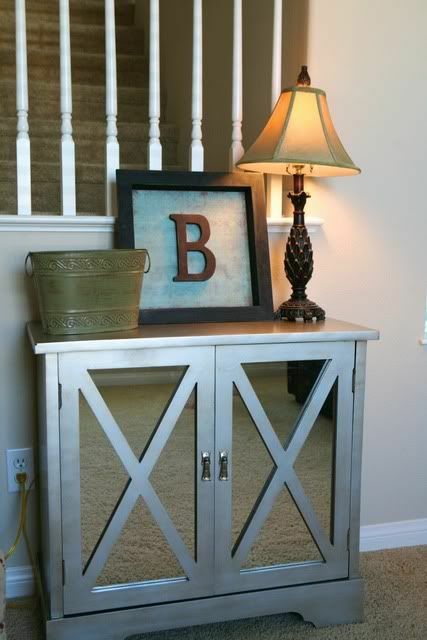 I LOVE that console table! Wow, what a great deal on the chairs! Love the pattern, they fit perfect with the room. It's so nice to get new furniture, and yours is awesome! Looks so so great! Got to love a bargain- especially when what you but is soooo pretty. Nice work Emmy!! Wow! Your chairs are PERFECT!! I love your new living room, is so....roomy and cozy. I'm also a fan of white trim. Very very cute!!!! I love your window frame on the wall too. 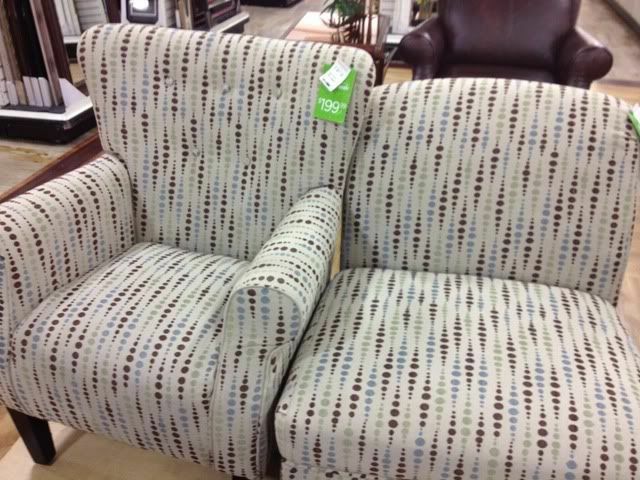 I wanna see a pix of the loveseat in your room. Oh I LOVE how it turned out. Fabulous! It looks great! 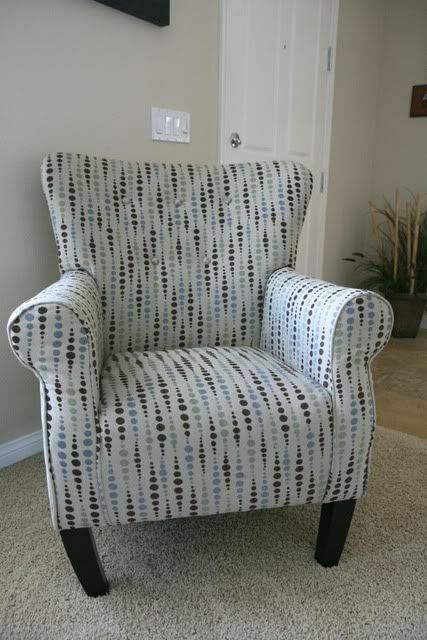 I love accent chairs. They are the best. I told you you could do it! You did great! Love all your purchases!! Success!!! Cute and inexpensive chairs? NICE! I love all the choices. And? With kids? 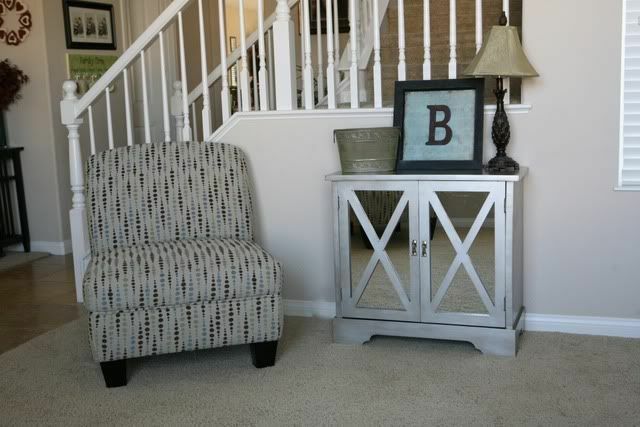 inexpensive furniture is nice! Wow, LOVE IT! I think you could stand some new pillows on the couch too. Perhaps bring in your bold color through them? Anyhoo, LOVE how it came together! Very nice job! I am glad the closest HomeGoods is an hour away or I would be in trouble! Love that place! That does look fantastic!!! I adore those chairs. Your house is beautiful. Looks good! I'm bad about decorating--I just don't have an eye for it. Well done! Those chairs look marvelous and the layout is perfect. Love the piece from Ross too. Those chairs are fantastic - I love the design! 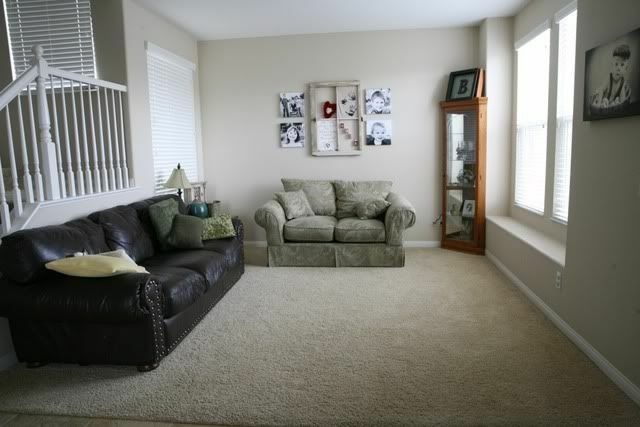 Your living room came out looking great - isn't it amazing how much things can change with just a few alterations?! Nice! I love the new chairs and the arrangement. 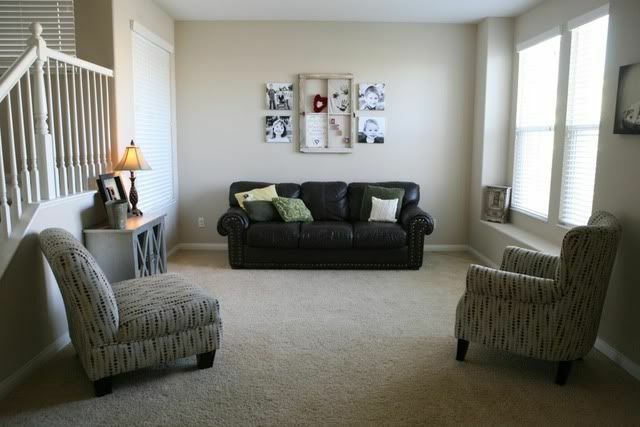 Your living rooms looks like a great place to get lost in conversation. So welcoming and cozy! You really hit the jackpot. SCORE! Excited to see it in person! It turned out great! I'm glad you posted pictures. What a great deal on the chairs too...and I think they're awesome! The colors may not be as bright as some of the others you looked at but the pattern really helps them to pop out. I love the chairs and little cabinet you got! The room looks great and kudos to hubby for arranging it all on his own for you! I love it!!! It all goes together so nicely. Now. Will you come and decorate my house, please? I love, love, LOVE it!!!! It looks absolutely perfect! I really like that one of those chairs is armless. Those are my favorites! :o) Everything coordinates so well together! You didn't even need new paint on the walls! The room looks wonderful. I love the cabinet. The chairs looks so comfortable. That looks great! I love the chairs! Turned out awesome and those chairs *were* a steal, too much to pass up on. I love what you changed around in there and I DO love those new chairs. 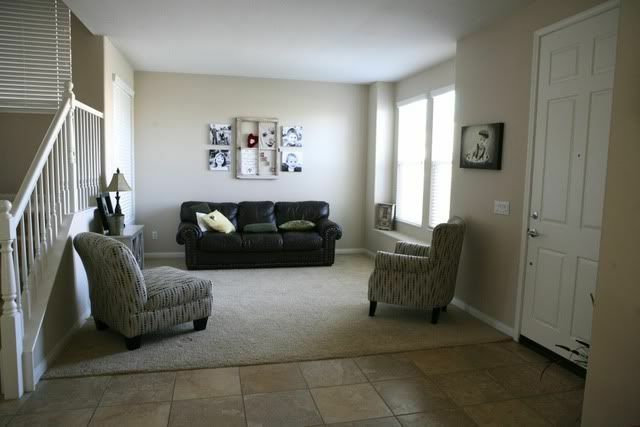 You know that mural above the couch is one of my favorites. It's just adorable. I love the new table too. Very cute, Emmy! I LOVE it! It looks so great! 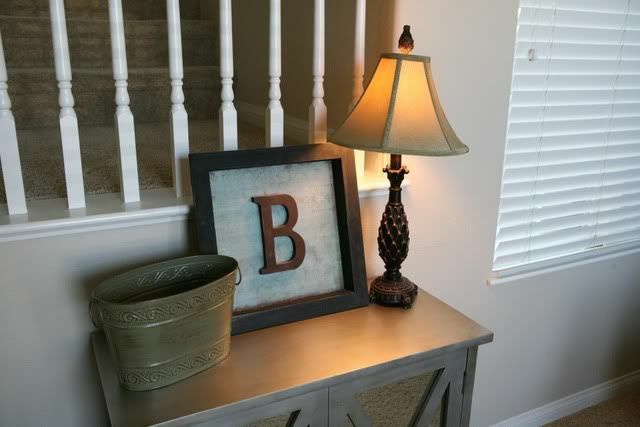 Isn't it so great how some rearranging and new additions can make a place feel so brand new?? Oh I like it! Especially the dresser thing (name??) with the B on it. Fabulous!